BTree is the index type used by default on CREATE INDEX. As I said in the introduction to indexes article, BTrees are also created automatically for primary key and unique constraints. Before I start going into the internal structure of BTree, I’d like to talk to you about pageinspect_inspector, a python library to generate a graphical representation of what’s going on inside PostgreSQL’s BTrees. You pass your index to it on a command line and it generates an HTML allowing you to explore pages and items of your index. I wrote it using the extension pageinspect. All the images in this article come from it. Here is a little video to show you how it works (where you might notice that I’m not a great frontend developer). What is a BTree ? BTree stands for balanced tree. In a balanced tree, all the leaves are at equal distance from the root. Moreover the root and parents can have more than two children which minimize the depth of the tree. Here is a comparison of the same data in the form of a binary tree and a balanced tree. 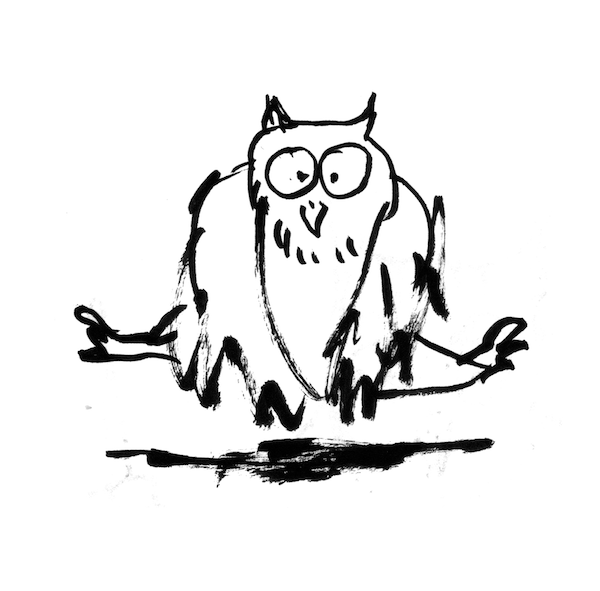 Postgres implements the Lehman & Yao Btree which has a few specificities that you will discover in this article, or if you’re really into it, go read their research paper. I did and it was a lot of fun (I guess). Let’s talk again about crocos. So as we said in the previous article, crocodiles eat candies like a 10yo left alone with money for dinner, and their number of teeth changes over life. It grows and then when they get old, they fall. Like humans. (Honestly, this is probably not 100% accurate, if you’re a vet, sorry about that, also, what are you doing here?). For that, we decided to create the following index. I generated the html for this index using pageinspect_inspector and here a first screenshot. The pointer to the root can change. It’s a bit early to go into the details, but after an insert, it can be necessary to split the current root into two pages, in which case a new root is created with pointers on the split pages. 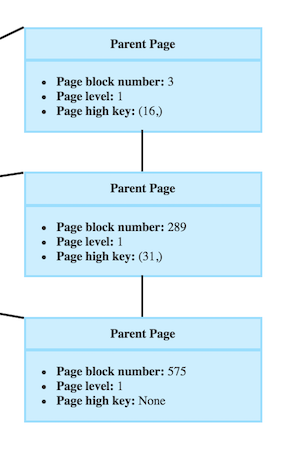 Page splits will be detailed in the insert algorithm part of the next article. If you prefer using pageinspect here is the query returning information on the metapage. 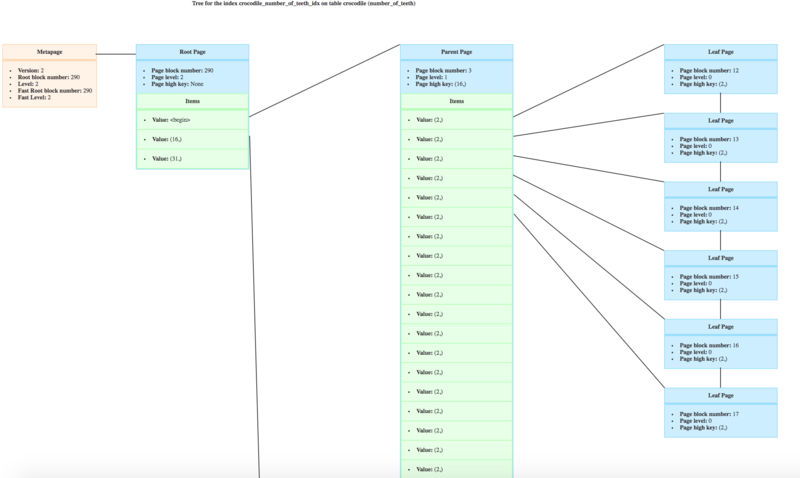 Thanks to the pointers to next and previous pages, pages in the same level are a linked list. This is a specificity of the Yao and Lehmann BTree. For example it’s very usefull in the leaves for ORDER BY queries. 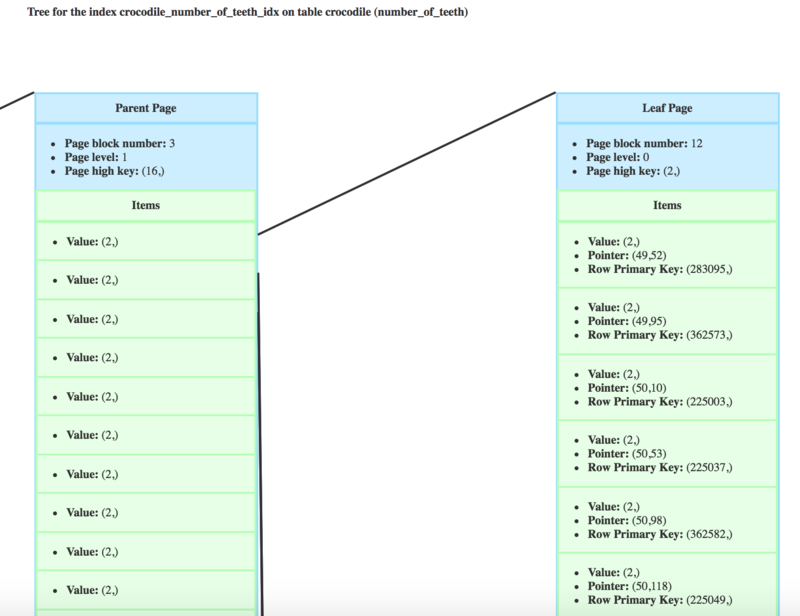 Postgres would start at the first leaf page and thanks to the next page pointer, has directly all rows in the right order. The high key is also specific to Lehman & Yao BTrees. Any item in the page will have a value lower or equal to the high key. I can see that in the page 3, I will find crocodiles with 3 or less teeth, in page 289, with 31 and less, and in page 575, there is no high key as it’s the rightmost page. The items of a page (that are in green in my drawings) have a value and a ctid. The ctid indicated the physical location of a heap tuple, you can read about it in the previous article. The difference between the parents/root level and leaves is that the ctid of a parent level page would point to a child page. In the leaves, the ctid is the one from the row. The value of an item in a leaf page is the value of the column(s) of the row. The value of an item in a parent page is the value of the first item in the child page. Here is what leaf level items look like. A Btree is a balanced tree. PostgreSQL implements the Lehmann & Yao algorithm. 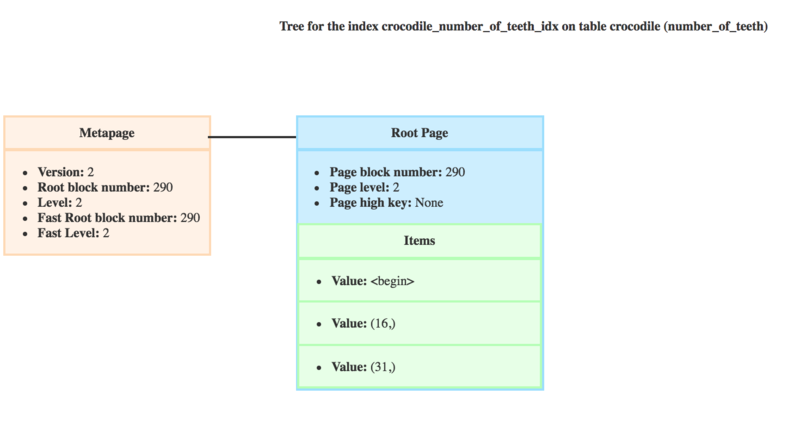 A BTree starts with a metapage containing information on the root and fast root block numbers and levels. Root, parent, and leaves are pages. Each level is a linked list making it easier to move from one page to an other within the same level. Pages have a high key defining the biggest value that can be found and inserted in the page. A page has items. In the root or the parent levels, the items point to a page on the child level. In the leaves, it points to the heap of the row in the table. Sometimes an image is worth a thousand words, so don’t hesitate to try pageinspect_inspector to visualize one of your own BTree indexes. In the next article we will go over the algorithms used to search and maintain a BTree index.